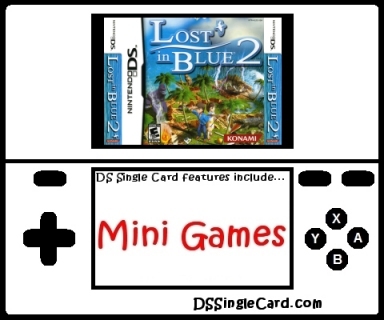 Lost In Blue 2 is set up with new Nintendo DS players (and players unfamiliar with the series) in mind with one exception: Multiplayer is located under "Multi-Survival" which seems like it would make sense until you see it right next to "Survive Together" (the main single player game). Players familiar with multiplayer gaming on the Nintendo DS will no doubt recognize the multiplayer icon next to "Multi-Survival" whereas others may not. The credit sequence is not excessively drawn out. Downloading is segmented so that players don't have to thoroughly disconnect and start over in order to switch game and yet not compromise the graphically quality. Aside from the setup snafu mentioned above, the menus are quite reactive and are programmed accurately (you actually get what you tap on). Options are large enough tap successfully and the buffer space in between option is sufficient to avoid fear of tapping the wrong option. Play control is surprisingly good. In Fire Starter, attempting to turn the game into a button-masher will cause you to flip the stick. You also have to know when to stop twisting the stick and blow into the Nintendo DS's microphone. In Milking, you have to balance the milking itself with the calming of the goat, which is excellently reactive. In Spear Fishing, the controls are so accurate that a couple seconds pass while recovering the spear and (whether intentional or not), the water seems to defract the light just enough that you can't always just simply hit the fish by tapping (that, plus the fact that the fish move). This is the biggest problem with the Single-Card Download portion of Lost In Blue 2: content; or, more specifically, the lack thereof. The graphics are beautiful and the sound effects are appropriate and not overbearing, but there is an astonishing lack of... well... everything. There are three mini games, but each is played in around a minute. Play them five times each to master them and you're still done after a quarter of an hour. I'll say this up front: The mini games are fun (extremely "mini" but fun) and they succeed in one of their primare purposes - get the prospective owners to experience the feel of how some of the main game plays. The problem is that it fails in its other primary goal: get people to enjoy the mini games long enough to feel the need to buy the game. What's there is fun. It's not flawless, but it's fun. The problem, however, is that there are not enough of them and the LONGEST you can play through each one is 90 seconds. Hopefully in the next installment (which has already been announced), there'll be more games and more depth per game. Assuming there's an improvement in the next go-around, I'll be looking forward to a much more enthralling experience that lasts a lot longer than this one does (in its Single-Card Download play mode). Program at least one or two mini games that are cooperative. Include a downloadable, interactive demo that introduces new players to the main/single-player game's story. Make the mini games Rumble Pack compatable. Click here to return to the DSSingleCard.com Lost In Blue 2 profile.